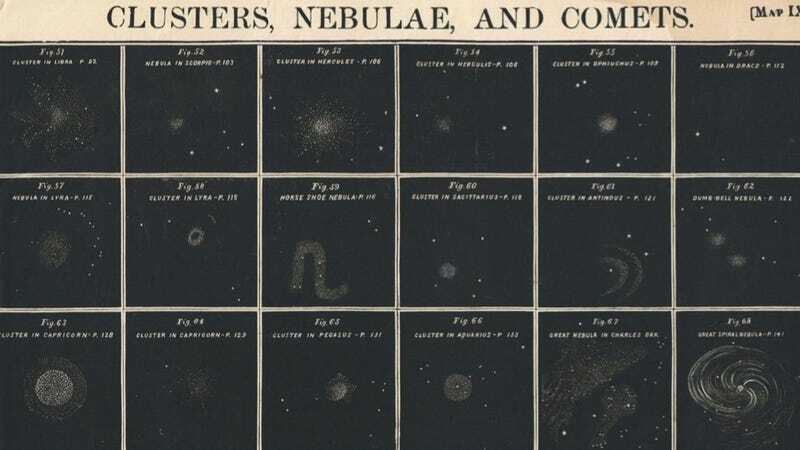 The little number you see up top — titled "Chart of comets, star clusters and nebula" — was engraved in 1856 by one W. G. Evans for Burritt's Atlas to Illustrate the Geography of the Heavens. My maternal grandmother, who died when I was six, was a devoted lover of astronomy, having made that a specialty at Lapham Seminary, where she was educated; and though she never personally showed me the beauties of the skies, it is to her excellent but somewhat obsolete collection of astronomical books that I owe my affection for celestial science. Her copy of Burritt's Geography of the Heavens is today the most prized volume in my library. Don't miss the spitting image of Halley's comet down at the bottom of the full-size image.